Who Is Dennis Uy, The Guy Behind The Country’s Third Telco? The reality show “Philippines’ Next Top Telco” is coming to a close and right now, there is one player ahead of the competition. After three companies submitted their documentary requirements to the government, only one company met the requirements and was declared the provisional winner: Mislatel. Mislatel will be a consortium of different companies and the building blocks of the third potential telco. China Telecom is a state-owned communications company in, well, China. However, little is known about Mindanao Islamic Telephone Company. The other companies that are part of the consortium are Udenna Corporation and Chelsea Logistics Holdings—and there is one guy behind these empires. His name is Dennis Uy and he’s on a meteoric rise to become one of the biggest and most successful businessmen in the country. The President himself lauded Uy as a person who “exemplifies the resilience of the Filipino entrepreneurial spirit.” His interests are diversified across numerous sectors and now he’s out to get the lion’s share in the telecom industry. Just who exactly is Dennis Uy? Let’s talk about his business activities. The public may have just recently heard of his name, but Dennis Uy’s empire has been in the making for a while now. Like most stories, his story must start in the beginning, going all the way to his roots in Davao. So that was the case until Dennis Uy came into the scene. In 2002, a young Dennis Uy opened a petroleum company that would eventually be renamed to Phoenix Petroleum. The company went public in 2007, the first oil company to do so since the Oil Deregulation Law. Since going public, the company has continued their expansion efforts, expanding its serviced areas beyond its home court. It even has a basketball team, the Phoenix Fuel Masters and a convenience store chain, FamilyMart. In 2018, the company sold its petrochemical logistics and oil terminal ventures to its parent company, Udenna. As of writing, Phoenix’s market capitalization is around P15.4 billion. Talking about Phoenix Petroleum is just scratching the surface of Uy’s story. Beyond Phoenix, Uy’s success is tied to the parent company, Udenna. Registered a few months before Phoenix became officially a company, Udenna serves as the holding company for all of Uy’s ventures, including Chelsea Logistics. This October, Udenna is set to strike a deal with ISM Communications to make a share-swap deal. To absorb the Uy-led ventures, Udenna will issue two billion Udenna shares to ISM, making it wholly owned by the latter. In exchange, ISM will be transformed into Udenna Holdings and it will issue 24.05 billion shares to people with a stake in Udenna. This will bolster ISM’s capital stock from P2.8 billion to P75 billion easily. If deal pushes through this December, Uy’s parent company will finally become a publicly listed company, just in time should it be declared that Mislatel will be the country’s third telco. If both of Uy’s companies are publicly traded, then it will become a big advantage to Mislatel’s big for the lion’s share. What will the benefits that can be potentially reaped by Mislatel with this? For starters, having not one but two publicly traded companies in its conglomerate will secure its credibility with the public, which can further translate to sales and subscriptions once its network goes live. In addition to brand equity and powerful advertising, they can also have the power to raise additional funds through stock issuance, both directly and indirectly. Should they issue more shares to the public, they can further boost their market capitalization and having a bearish trading can spur its prices upward. Meanwhile, they can secure loans from financial institutions because they have the leverage to do so. All in all, this is a win-win if Mislatel secures the spot for the third telco. Since President Duterte’s ascent to the highest position in the country, Uy’s success has been on a sizzle. Since he unveiled his plans to acquire ISM Communications through a share-swap deal, details of his shopping spree have been made public. In a report by the Philippine Daily Inquirer, Udenna is reported to have acquired P85.8 billion in debt by the end of 2017. Currently, Udenna owed P3.74 billion in finance charges, which is almost double of its income last year at P1.88 billion. Another deal the company bagged the $300-million deal in Cebu to construct a gaming hub in a beachfront property in Lapu-Lapu City. 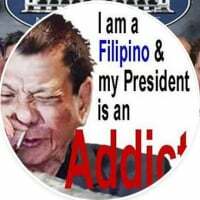 Banks who supplied the holding company with the capital to do its binge shopping were BDO Unibank, Philippine National Bank, and the Bank of China, one of the foreign financial entities courted by Duterte in its overseas trips to China. Uy’s aggressiveness doesn’t stop there, with its eyes trained on having more stakes in the infrastructure sector. According to reports, the company submitted an unsolicited offer to put up a monorail system in Davao. Meanwhile, Chelsea Logistics received tailwind as the original proponent status has been approved to pour P49 billion in the rehabilitation of the Davao International Airport. MANILA, Philippines — Davao-based businessman Dennis Uy admitted his close ties with President Rodrigo Duterte and some of his Cabinet members when he faced a Senate probe on Thursday. Uy made the admission when grilled by opposition Senator Antonio Trillanes IV during the hearing of the Senate committee on public services, which inquired into the government’s selection process of the third telecommunications player in the country. The businessman is the chief executive officer of Udenna Corporation, which is part of Mislatel Consortium that was named last November as the country’s new dominant player. Uy flip-flopped when Trillanes first asked about his closeness to Duterte. “Are you close to President Duterte?” the senator asked, to which the businessman answered no. “No, you’re not?” Trillanes asked again. “I’m from Davao…” Uy said but he was interrupted by the senator, who pressed for a categorical answer to his question. “Are you close to him or not?” Trillanes asked. The senator next asked if the businessman was also close to the President’s former special aide, Bong Go. Uy also responded in the affirmative. Still responding to Trillanes’ queries, Uy admitted to contributing P30 million to Duterte’s campaign in 2016. Uy flip-flopped again when Trillanes asked if other officials of Udenna also contributed to Duterte’s campaign. “Hindi po,” the businessman said. “Hindi? Are you sure? May listahan ako dito,” said Trillanes. The senator then enumerated some of the company’s officers, including Uy’s wife, Cherylyn Uy, who had contributed to the President’s campaign. 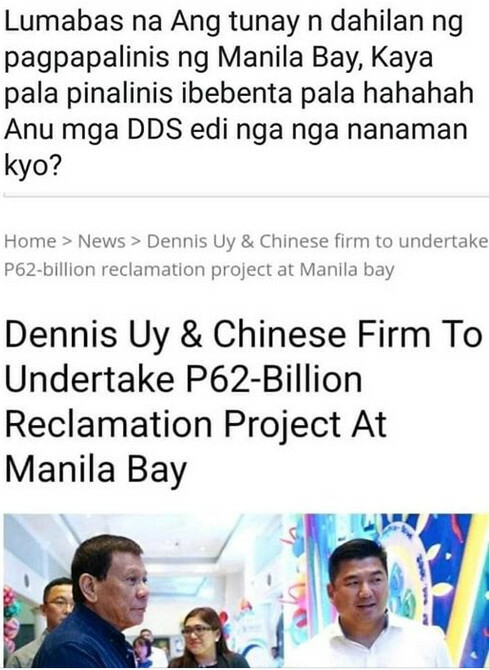 Uy confirmed all the names and contributions enumerated by the senator, including the financial assistance of his business partner, Efren Uy, board member of Chelsea Logistics Holdings Corp.
Aside from Uy’s firm, Mislatel Consortium is also composed of Chelsea Logistics and state-run China Telecommunication. Uy also confirmed that Finance Secretary Carlos Dominguez III’s brother used to be a director of his Phoenix company. Trillanes said the Finance secretary happens to be part of the oversight committee on selection of the third telco. “So kaibigan mo si Bong Go, si Duterte kaibigan mo, yung kapatid nung Secretary of Finance na member oversight committee, dati mong members ng board of directors, yung officers ng board of directors mo ay nag-contribute kay Mr. Duterte — so ano ito, medyo lumiliwanag yung pagkaluto dito ano?” the senator asked. Uy also confirmed being with members of the oversight committee like Executive Secretary Salvador Medialdea, Dominguez, and National Security Adviser Hermogenes Esperon Jr in a private jet which the businessman partly owned. Trillanes noted that during this time, the government was at the “peak” of choosing the third telco. Uy also happens to be Duterte’s adviser on sports. During the Senate Hearing last Thursday, January 24, Senator Drilon made it appear that the Selection Process for the Third Telco done by DICT/NTC was faulty considering that the awarded New Major Player, Mislatel, has no valid franchise as required by the Terms of Reference (MC-09-09-2018), since its franchise is ipso facto revoked. That is far from the truth. NTC took much effort in doing its due diligence to make sure that all requirements of the MC are complied with. First, NTC, during the pre-qualification period, wrote Congress if the franchise of Mislatel is still valid, and got the answer that on record, their franchise has never been revoked. In other words, since there is no declaration of revocation by competent authorities, NTC has no right to consider the francise as revoked as the presumption of regularity and the validity of the franchise must be respected. This is no different from marriages which the law says are void ab initio. Parties still need to go to court and ask for a declaration of nullity of marriage, and absent such, no other person or entity, private or public, can claim that said marriage is void ab initio and just throw away the marriage certificate, and ignore all rights granted by law to the married couple. Also, the Supreme Court has already ruled that since a franchise is a property right, there must be due process for it to be revoked, notwithstanding the ipso facto provision. A direct action for a quo warranto is the proper action to take. To date, no quo warranto proceeding has been filed by the State against Mislatel. The truth is that so many telcos may have in one way or another "violated" their franchises, but without due process, none of these franchises have been actually revoked. 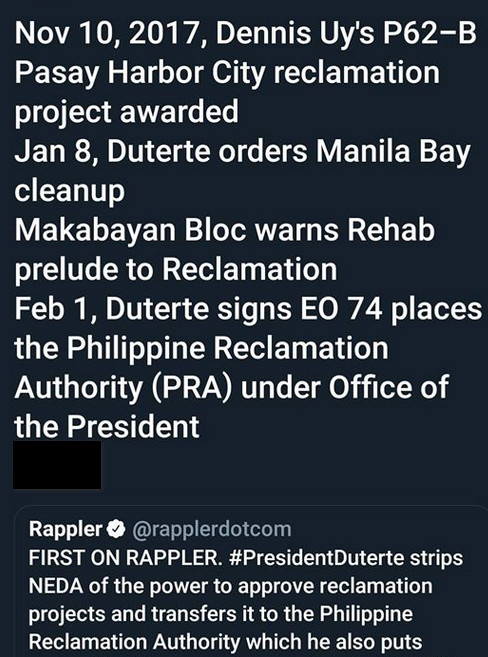 If we now consider them revoked without due process as what Senator Drilon would want to do with Mislatel, contratry to the Supreme Court decision that revocation of franchises can only be done through a quo warranto action, then our whole Telecom industry will fold up, bringing us back to the dark ages. Surely, this would be against public interest. All the points brought out by Senator Drilon have been extensively deliberated in the Lower House of Congress. But after voting, Congress approved the transfer of Mislatel's franchise to the consortium and brought it up for the consideration the Senate. The Senate will still vote on it as a body, before it can be finally resolved whether Mislatel would be the third telco. All these are within the post-qualification requirements of the selection process and still within schedule as the deadline is on February 17, 2019. Finally, I hope Congress consider changing some of the provisions in the franchise it grants telcos. For example, it is almost impossible now to roll-out and become operational within a year as a telco. Much more if there are fortuitous events like natural and man-made calamities that can delay the roll-out. This would make franchises much easier to comply with. PLDT and GLOBE must be very happy that there might be "no" 3rd Telco. pero is reshuffle muna yun bid committee kasi sabi nila "...... ONLY ONE SUBMITTED the COMPLETE REQUIREMENTS." ang totoo pa "...... WALANG NAKAPAG-SUBMIT ng COMPLETE REQUIREMENTS." 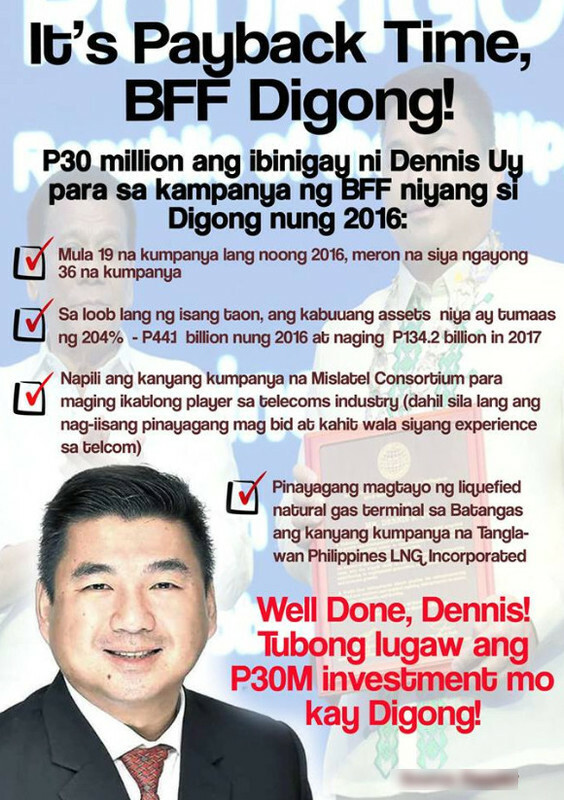 Senator Leila de Lima believes businessman Dennis Uy bagged the third telco slot only because of his connections to President Rodrigo Duterte. “Duterte’s Davao Group, through Dennis Uy, is on a roll in cornering lucrative government contracts,” said de Lima. She cited Uy and his close allies’ donations to Duterte’s campaign aswell his generosity in lending his private jet to top Cabinet officials. De Lima zeroed in on National Security Adviser Hermogenes Esperon for turning a blind eye on Uy’s glaring conflict of interest. She said Esperon was part of the oversight committee on the third telco player contract yet he did not see anything wrong in taking free rides on Uy’s private jets. By some “magic trick”, de Lima said Uy’s Mislatel was adjudged the lone qualified bidder for the third telco slot despite being a paper corporation with no track record whatsoever. “What is more worrisome is that under Duterte, there is even no longer any pretense to conceal the use of public authority to serve private interest. This is corruption at a new level, one that is characterized by impunity, shamelessness, and disregard for legal niceties and public opinion,” said de Lima. .... Dennis Uy has no intention to fulfill the GOVERNMENT parameters of the Telecom Franchise. kumpeto yun documentation pero hindi nila susundin yun batas tulad ng pag-IPO ng public stocks. Padrino pala ito. Kakabwisit talaga sa bansang ito. even the blind man saw it coming. LoL.